So here I am in Southern California, getting too much sun and doing a lot of hiking. We spent most of Sunday clambering over stuff up Palomar Mountain, a few tens of miles of orange groves away from San Diego. Chef Carl Schroeder has been raking in the plaudits at Market (3702 Via De La Valle Del Mar, CA 92014, tel. (858) 523-0007) for his minutely, obsessively prepared dishes full of bouncingly fresh farm ingredients, so we swung by that evening, in the middle of the white corn season, to see what was on offer. For me, the best of Californian cooking is all about the produce. This is one of those menus where the provenance of every last green bean is described, along, of course, with the sourcing of all the meats on offer. Schroeder is using whatever is at the peak of its season here, so those beans, the picked-this-minute sweet corn, and tomatoes bursting with the Californian sunshine all find a place on the plate. 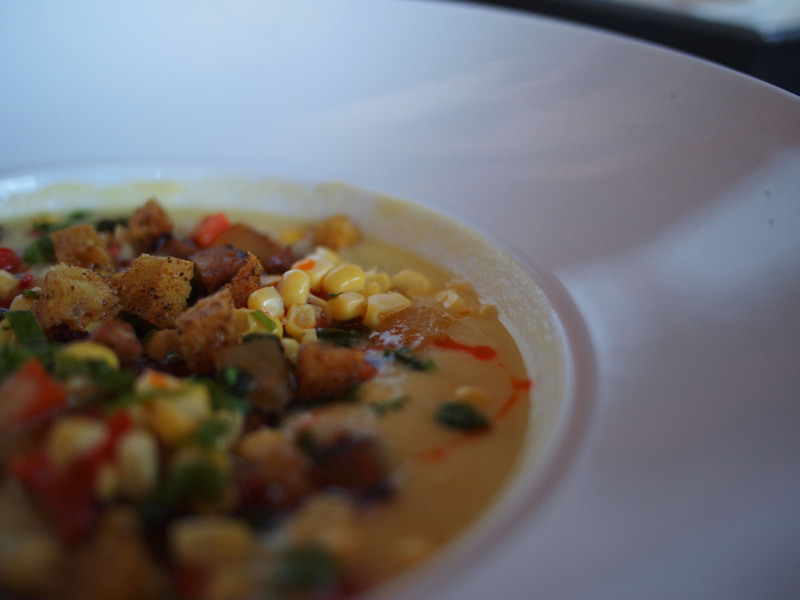 The chowder above was gloriously, thickly complex. Dense stock, a really good andouille sausage providing a velvety background of pork and spice, and astonishing depth of flavour from a whole garden of vegetables and herbs supporting the sweetness of some corn picked at the height of its ripeness. All types of cuisine can be had at the many restaurants San Diego California has to offer. I ordered Schroeder’s signature dish, a beef short rib braised in Cabernet – the beef and the wine local, of course. A stupidly American portion size (what you can see in the picture above is only half of what was on the plate), and I was a little ashamed to finish the whole thing. 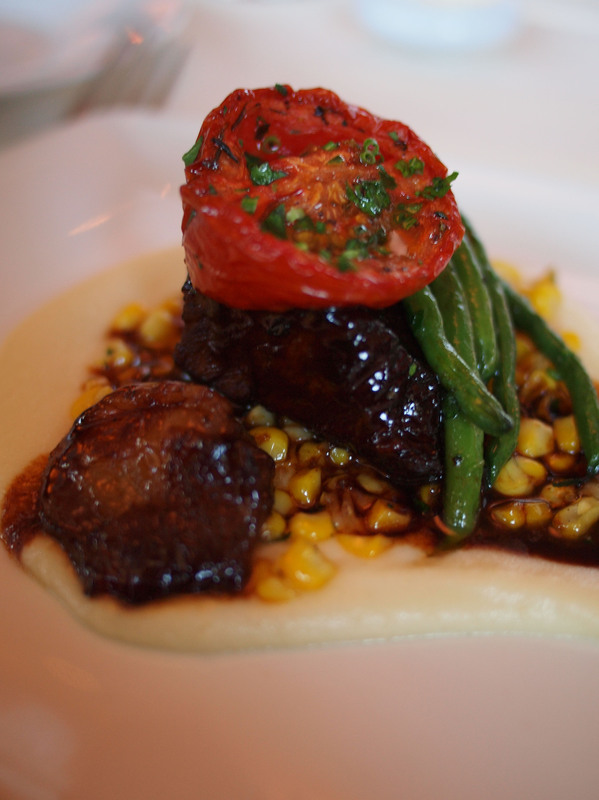 Blame the hunger caused by a day’s hiking and the fact that this short rib was really pretty darn fabulous. 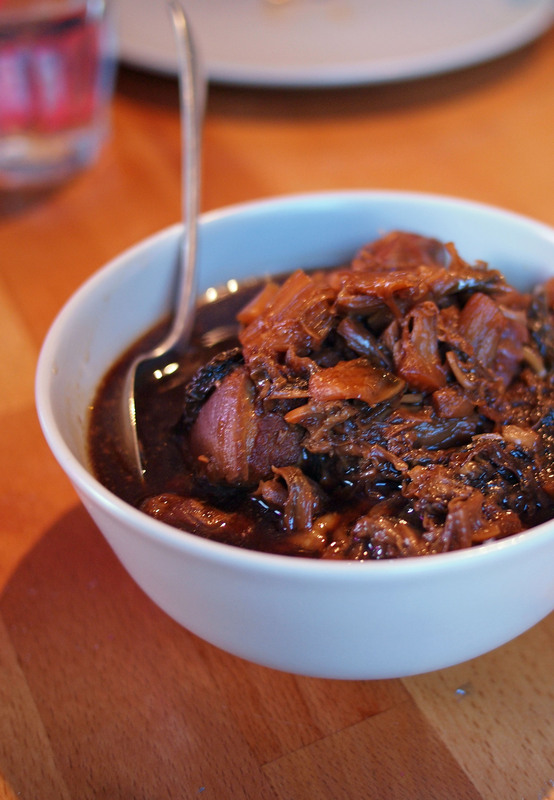 All its connective tissues were reduced by long, slow sous-vide cooking to a perfectly tender mouthful, the dark Cabernet jus penetrating all the way through the joint. This was once a well-marbled and cheerfully pudgy cow, and all the fat had melted through the beef, carrying flavour and a lovely mouthfeel. More corn here, and some balsamic cippolini onions alongside a sweet onion and potato mash, just in case you don’t feel affairs on your plate are rich and dense enough already. 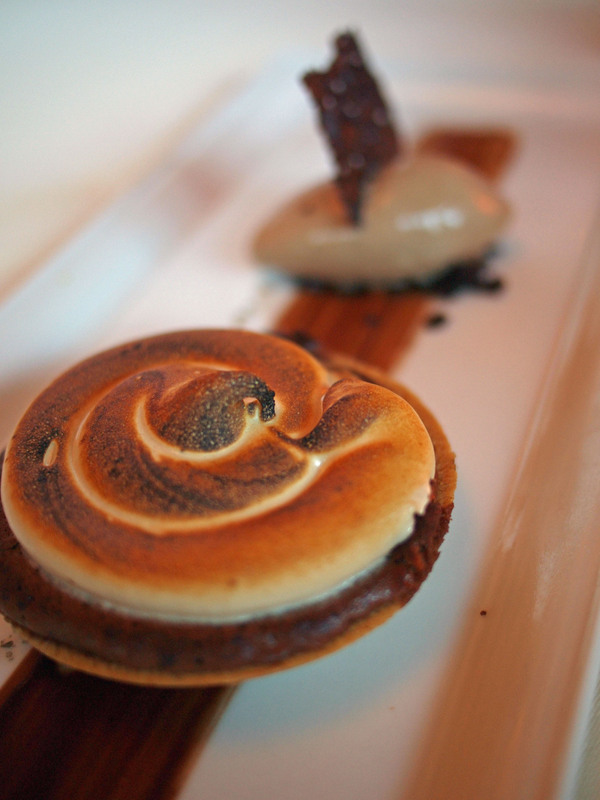 Another signature dish for dessert – pastry chef James Foran’s take on a s’more. If you’re English, you may not have come across s’mores. Imagine your Girl Guide/Boy Scout marshmallow-on-a-stick souped up, American style. Here, kids around a camp fire sandwich that marshmallow between two Graham crackers (nearest UK equivalent: the humble digestive biscuit) with a chunk of chocolate, and perform complicated grilling manoeuvres until the innards are melted. Here at Market, the chocolate is a fondant in a shell bearing only the barest resemblance to a Graham cracker – which is to say, that shell is crispy – and topped with a swirl of marshmallow. The shell is cheek-suckingly rich, flavoured with chocolate and cinnamon, and that marshmallow is made with brown sugar and a little smoked sea salt. Add a scoop of malted chocolate ice cream, and you have one hell of a dessert. It’s a warm-feeling room, all chocolate leather, persimmon walls and modern-googie design touches. And there’s a fantastic and thoughtful wine list (although I ended up with a bottle of Kanchiku junmai sake, which was a great accompaniment to everything I’d ordered). A couple of duff notes: some insipid and tasteless asparagus with a smoked salmon starter, which stood out after the great season we’ve just had in Europe and alongside the other impeccably seasonal vegetables, especially since the kitchen had tried to remedy matters with a far-too-sharp dressing. Tables are uncomfortably crammed in. I felt awkwardly party to every detail of the second date going on to my right and the birthday on my left. And there’s really no excuse for making your parking valet-only, Market, when it takes less than ten seconds to walk from the end of the car park to the restaurant door. Still: all in all, a lovely, bright and fresh meal, and a restaurant I’d definitely visit again. Food blogging demographics are a decidedly odd thing. A totally disproportionate number of us have at least one South-East Asian parent. (KevinEats has noticed the same phenomenon in LA food blogging circles.) And of that disproportionate number, an even more disproportionate number have family from Singapore or Malaysia. Not so much of a surprise, I suppose; I’ve never been anywhere else in the world where food is such an ingrained part of the overall culture of a country. So when Goz (behind the cooker) and Wen (front of house) started up the +(65)/plusixfive Supper Club, named for the Singapore telephone code, they probably shouldn’t have been as surprised as they were that the first night’s bookings filled up with a positive legion of bloggers nostalgic for pandan cake and crispy fried anchovies. At my table alone, there were four of us, shutters clicking, making “eeee!” noises every time a new dish arrived, and slapping each other away with the serving spoons in an attempt to get to the best bits. Supper clubs are a tricky thing for the hosts to balance. Too much formality can be uncomfortable for diners; too little, and your service can fall apart. You’ve got to hope that your guests will get on well: ideally, the food should provide a talking point to get conversation moving. 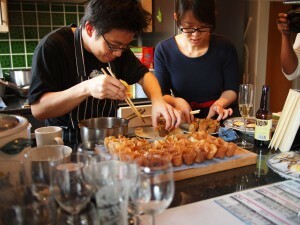 I’m amazed that this was only the first time that Goz and Wen, with help from their friend Alex, had hosted a supper club. The service was slick; the hosts were warm and great fun to chat with. 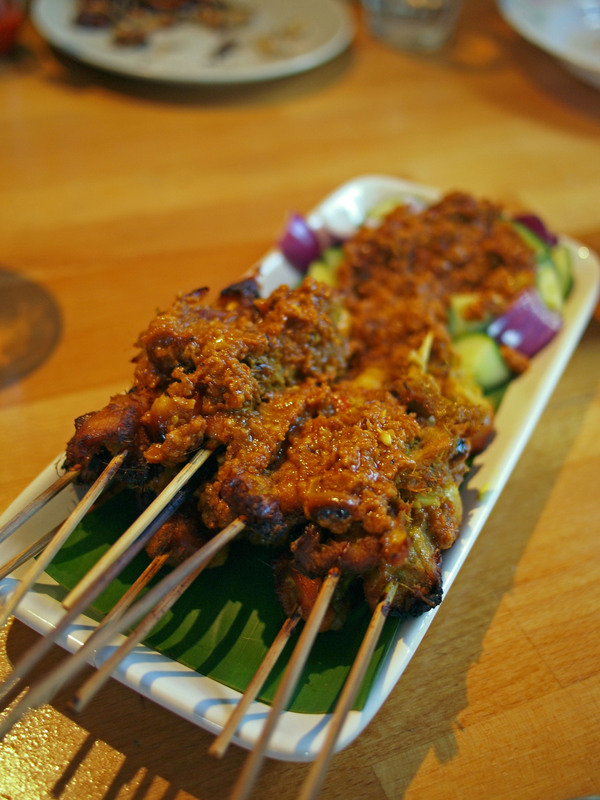 The company was superb – nothing brings a table of strangers together better than a shared interest in a particular cuisine – and the food, the most important part of the evening, was like going back to Malaysia and eating in my auntie’s house. Goz prepares the food in a tiny kitchen area overlooking the open-plan dining room. There are two rice cookers on the go, churning out fragrant coconut rice. There’s a wonderland of woks hanging from the walls, and by some magical space-bending trick, dish upon dish upon tray upon baking sheet of food keeps coming out of the tiny space. Where was it all hiding? The pie tee, filled. 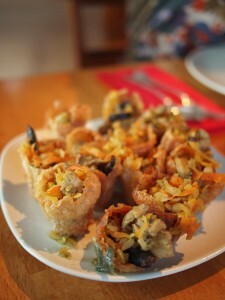 These have to be eaten within about five minutes of preparing so the shells don't go soggy. 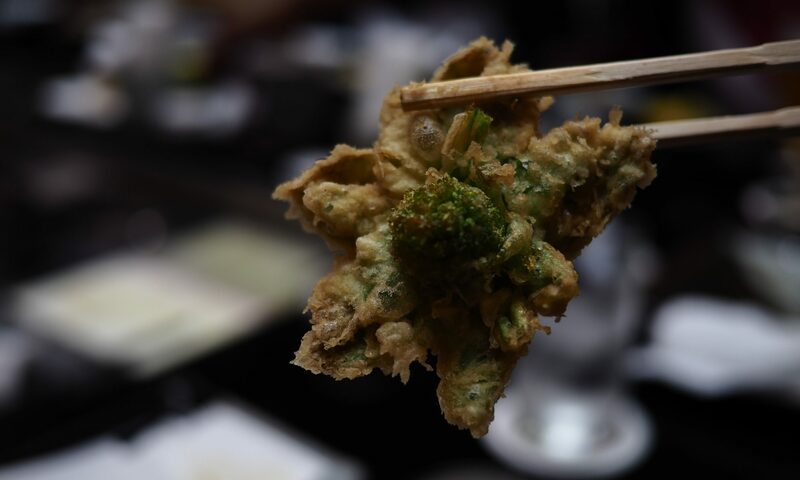 Unsurprisingly, we didn't have any trouble eating them in time. 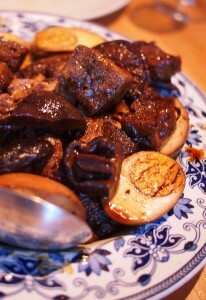 I feel personally responsible for putting Goz to a lot of trouble over one dish. We got talking on Twitter about kueh pie tee, or top hats: cotton-reel sized shells made from a very thin rice flour batter, and filled with any number of ingredients. They’re a nightmare to prepare, and I’ve never managed to make them well enough to blog (there’s lots of faffing with heated brass moulds on a stick and woks full of terrifying boiling oil). So I was touched, thrilled and a bit ashamed when Goz made a giant stack of the things in addition to the eight courses already on the menu. 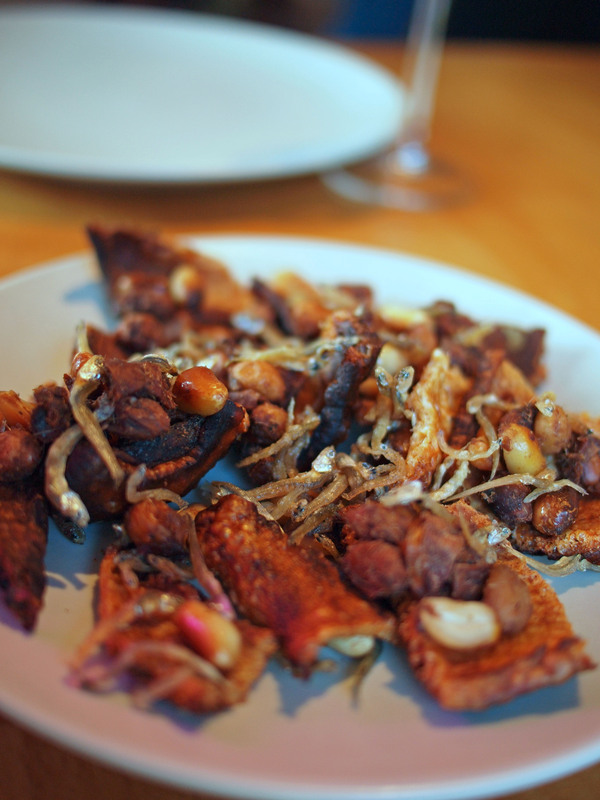 Even if you’re not an expert on Singaporean/Malaysian food, you’re likely to recognise some of what arrives on the table. Goz’s chicken satay, lemongrass-fragrant and spiked with peanut sauce, is terrific, little nuggets of skin left on so they crisp under the grill. 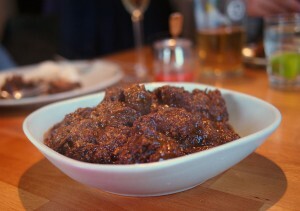 Beef rendang is also a dish you might have come across in restaurants in the UK. Goz’s beef rendang (my recipe for rendang is here – you’ll notice that rendang is basically impossible to photograph in a way that makes it look pretty) has a twist to it, though; it’s made with succulent, flavour-packed ox cheeks. 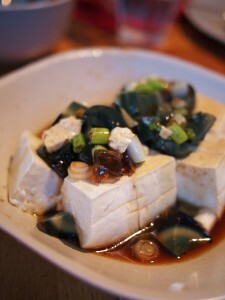 Tofu in a sesame and soy dressing was served with century eggs. I love century eggs: back in Malaysia we ate them with strips of pickled ginger, and I think they’re fantastic studding a bowl of congee with shreds of roast pork. They also work as a good personality test. I find that if someone who’s never encountered one before eats a piece with gusto, transparent brown white and greeny blue yolk and all, I’m almost certainly going to like them. Goz saved the savoury dish that we thought the best for the end. Teochew braised duck with hard-boiled eggs and spongy tofu, all the better to soak up a gorgeously rich, dense and meaty dark sauce. Terrific alongside the Hainanese vegetables with glass noodles and a dollop of that coconut rice. Tea ice cream and a sort of cornflake praline. I could have eaten as much of this as Goz had room in his freezer for. 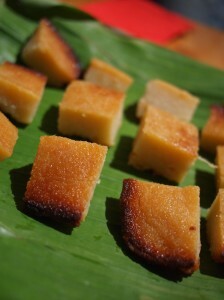 Kuih ubi kayu. If you visit Goz and Wen, make sure you save plenty of room for these - and make sure you grab a bit that touched the edge of the pan. Teh tarik (pulled tea) ice cream made with an almost impossibly strong black tea was a lovely way to cool the mouth. Teh tarik is a sweet, strong, milky tea which is cooled by pouring in great loops between two glasses until it’s warm and frothy. 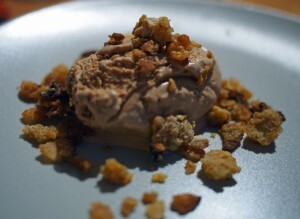 Goz served it with crushed caramelised cornflakes; a terrific flavour match and texturally really good with the ice cream. Kuih bingka ubi, a lovely soft, syrupy, mouth-melting cassava cake, was meant to be a petit four to accompany our coffee, but our table ate them all in about five seconds flat, before the coffee had even brewed. Goz, not to be outdone, toasted up some pandan cake for us instead. 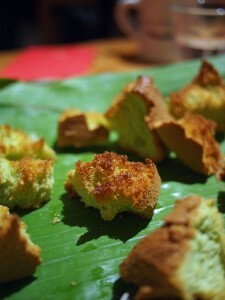 Pandan cake will be familiar to all Singaporean or Malaysian readers, and can be bought at some oriental bakeries and supermarkets in the UK. It’s a very light chiffon cake with a bright green crumb, flavoured with the grassy fragrance of pandan leaves. None of us had every tried it toasted before, and I don’t think I’m ever going to go back to eating it straight again. Broken into chunks and grilled until the edges are barely crisp and golden, it made for a lovely accompaniment to the coffee, imported from Singapore roasters. I live an hour and a half from +(65)/plusixfive, but I’m already planning my next trip. Goz, Wen and friends are doing something really special here: Singaporean home cooking and Singaporean hospitality that makes you feel a million miles away from London. Keep an eye on their website or follow them on Twitter @plusixfive to find out when they’re next hosting an evening, and bring plenty of Tiger Beer!